Page 69 of occurs about three-fourths of the way through a story called “End Times,” which is told from the perspective of a woman who can see into the future, past her own death (of natural causes at an early age), to the year 2033 when the world comes to an end. Her vision of the future focuses on her husband, Aaron, and teenage son, Cole, and how they will cope with the environmental catastrophes leading up to the apocalypse, as well as their shared grief of the protagonist’s absence. 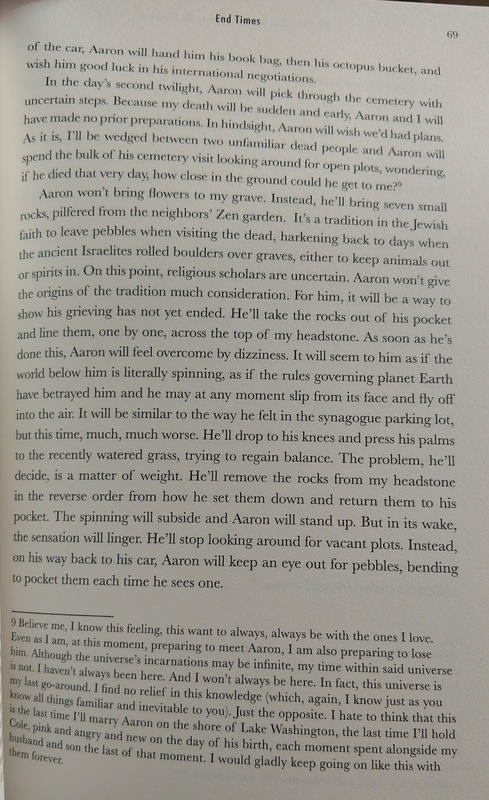 On page 69 itself, Aaron visits the protagonist’s gravesite while struggling to function under the weight of a change in Earth’s gravity (one of the signs the end of the world is approaching). I’m Fine, But You Appear to Be Sinking is a collection of short stories that twins the mundane with the bizarre in a variety of different settings. The stories aren’t linked and the characters do not all occupy the same universe, but they all share the common thread of something being very off in an otherwise very normal situation. For example, in “End Times” Aaron and Cole continue on with their domestic routines (school, clubs, homework, work, meals, shopping, etc.) while the world literally crumbles around them. These juxtapositions were a lot of fun to write. And I hope they’re fun to read. Most of the stories are pretty dark, but there’s humor to that darkness, and absurdity. Do you think this page gives our readers an accurate sense of what I'm Fine, But You Appear to Be Sinking about? Does it align itself with the books overall theme? Very much so! 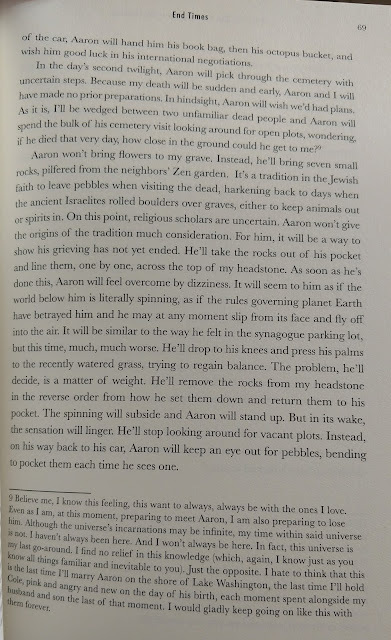 Page 69 begins with this sentence “As Cole gets out of the car, Aaron will hand him his book bag, then his octopus bucket, and wish him good luck in his international negotiations.” That’s pretty typical. Cole is on his way to a Model United Nations meeting at his high school, but he’s also got a baby octopus with him, which he rescues earlier in the story and then keeps with him in a bucket for the duration. That’s the way it is for the rest of the book, too. Pretty much every primary character in each story has their own octopus in a bucket, so to speak – something that’s evidence of them being pulled out of their normal, everyday routine. But they don’t ever want to acknowledge it. Cole just goes along, acting as if having an octopus in a bucket is totally normal. It’s just like the title of the collection. These are characters, throughout, who can see that others around them are in trouble, but refuse to acknowledge the trouble that knocks at their own door. 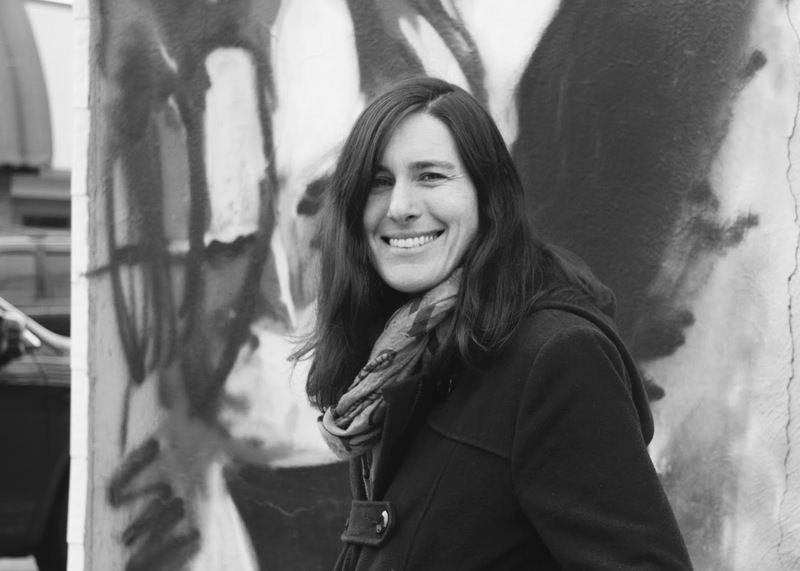 Leyna Krow lives in Spokane, Washington with her husband and daughter. I'm Fine, But You Appear toBe Sinking is her first book.